Thanks to Susan for hosting another Sunday Photo Fiction Challenge. This week’s photo is courtesy of first-time photo contributor Subramanya Bhat. 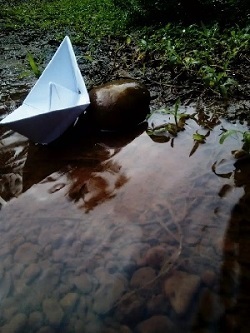 She saw the little boat and her eyes filled with tears. Where had it come from? It wasn’t damaged for it to have been out in the rain. Bending down to pick it up, she saw her reflection in the water. Where had the years gone? When had she got to look so old? Her hands trembled, the fingers bony and distorted, making her grasp difficult. She clutched the precious paper to her heart. It was made just as she remembered, folds upon folds sometimes used as a cup, but more often a boat to sail downstream or under bridges all those years ago. It felt warm in her palm, as if it had a heart of its own and was soothing her sorrow. She let the tears flow. She felt a hand in hers, turned and lifted her face towards that familiar smile. It wasn’t there, but the hand so tiny in hers made her look down. Big blue eyes gazed up at her. She looked across to where her grand-daughter pointed. A mist was slowly dispersing. This entry was posted in blogging, Challenge, photoprompt and tagged spf, Sunday Photo Fiction. Bookmark the permalink. One reflection in clear water brought back so many memories and brought reassurance someone is always with her. Thanks for commenting. Have a good day. Thans Michael. I could never make paper planes but did cups OK.